Some notes on equipment we've used for moving Helen around, in case our experience is useful for anyone else. We started with a large convertible pram-stroller, a Bugaboo Cameleon. This was good early on, but it only just fitted into our car boot (with nothing else) and was very bulky. 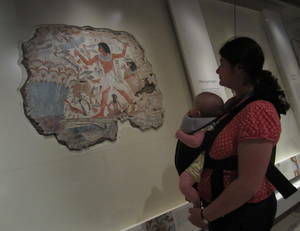 We soon replaced it with a Maxi-Cosi Mila, a much lighter-weight stroller, which we're still using. With small wheels it's not good off-tarmac, but it's fine for getting around towns, and we took it with us when we went to Australia. The rain-cover gets a fair bit of use, and when necessary we have improvised a sun-shade with a piece of cloth. We started off with a Kari Me sling and soon acquired a Baby Bjorn as well. 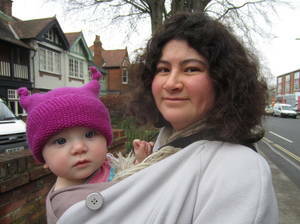 I never really got the hang of the sling, but Camilla enjoyed using it early on. 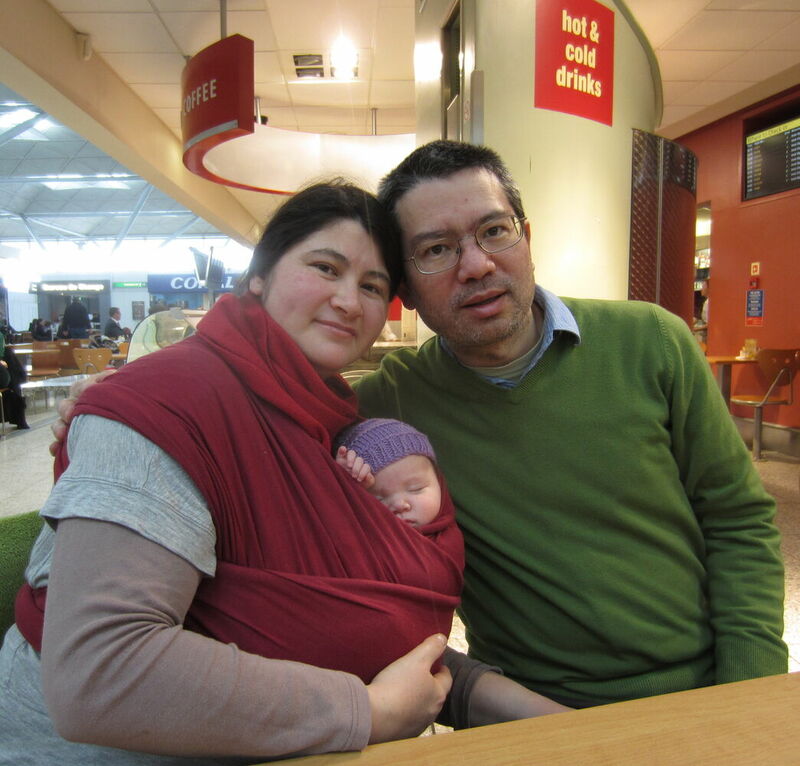 The Baby Bjorn was great — it can be used with the infant facing outwards as well, which is nice — but it never really sat well on me, with the main strap around my chest rather than on my waist, and once Helen hit about 7.5kg it started to get really uncomfortable for any distance. Camilla now has an NCT sling. Friends gave us a baby backpack, a Vaude Jolly Comfort. 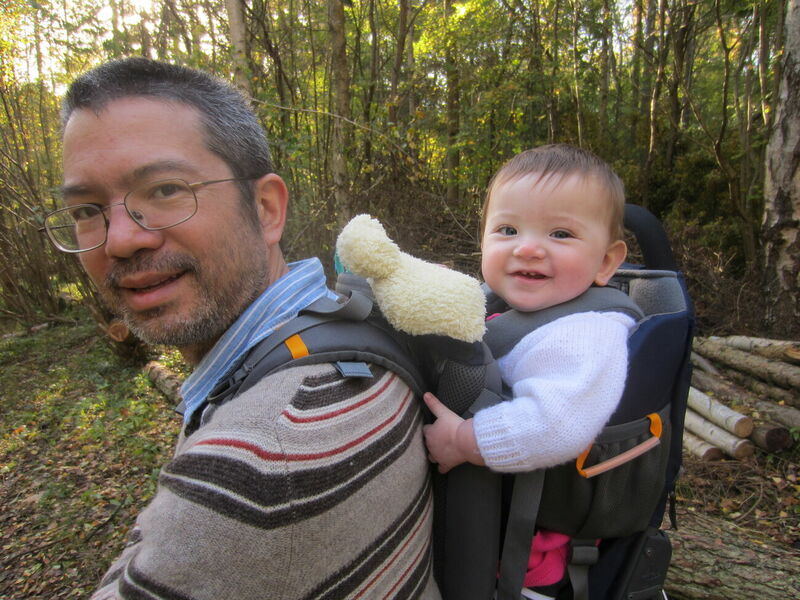 Being used to hiking with a backpack, I find this really comfortable, and a backpack is the only thing I'd consider carrying a 10kg infant in for any extended distance. And Helen really likes it, I think because she has such a good view. This may get more use when the weather improves! One drawback is that you can't see the child well when they're in it, or readjust their hat or wipe their nose or anything like that. And I miss not being able to carry my own backpack, which I generally take everywhere with me. We spent some time thinking about baby cycling options. We tried a bicycle trailer, both a friend's and one borrowed from a shop, but decided in the end that for the relatively short cycle to nursery - maybe 10 minutes - the added faff of unfolding and attaching and then detaching and folding a trailer wasn't worth the extra safety (and the most likely accidents are probably in getting the child in place at the beginning or end of a trip). We ended up with a front/centre-mounted Wee Ride seat on my bike and a rear-mounted Co-Pilot seat on Camilla's. The drawback of the front seat is that one has to cycle a bit unnaturally, because the seat gets in the way of one's knees, so I wouldn't want to do any long trips with it. 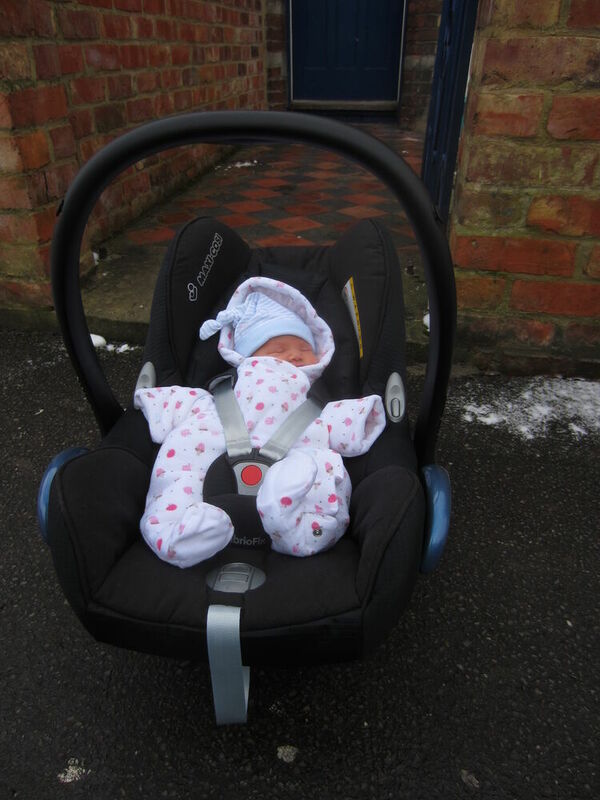 Otherwise both seats work fine for the nursery run, or trips into town. Thanks for the tech review. We started off with a Baby Bjorn, but then both my wife and I found that we were developing back-ache. We changed to an Ergo and have kg). Great blog - keep it up!